Shoppers at Max’s have a decided advantage: 90 percent of the inventory is not found elsewhere in the Twin Cities. It offers handmade gifts from glass art to chocolates and jewelry. 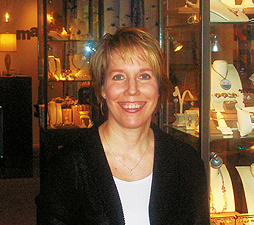 The store is the namesake of owner Ellen Hertz’s grandfather, who spent 54 years in the jewelry business. However, Her original jewelry-store concept expanded quickly to include items for the home, as well as her personal passion: chocolate. Perhaps the best way to get a feel for Max’s jewelry and decor selections, short of stopping in to the store, is to visit the Web site at <www.stylebymax.com>. Featured jewelers, for example, often incorporate unusual metals like oxidized sterling or blackened steel, and unique combinations of stones. Instead of the modern standby of harsh geometric shapes, they often embrace a more natural grace and fluidity in their designs. Chocolates grown and packaged in Madagascar have a different flavor than those from Ecuador. Items from both countries are available at Max’s, as well as chocolates from France, Italy, and other parts of Africa. Max’s also carries chocolates with unusual flavors, such as spicy habanero peppers, ginger, sesame seeds, and single malt scotch. To sample some of Max’s exotic chocolates, stop by the store at 3831 Grand Way (Excelsior and Grand), St. Louis Park. Parking is available at two nearby free ramps, as well as in front of the store.